This question is often asked of us so we thought we’d share some practical ways for you minimise your costs. The biggest misconception is that by printing on thinner paper you will save costs. Whilst there will be a small saving, it is not going to be significant on your average run of let’s say 500 A5 flyers where the difference between printing on 128gsm and 200gsm would amount to approximately R62.00 – not really noteworthy is it? 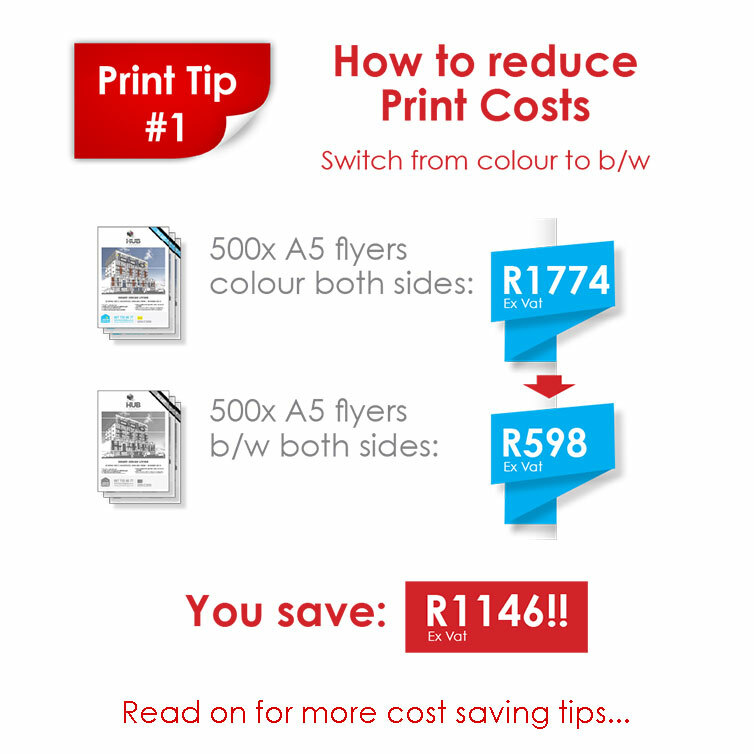 Let’s compare that to printing on one side instead of both for the same print run, or substituting black and white for colour where the difference is between R580 and R1150 – now that’s a cost saver! Where paper does make a difference is on high volume runs, i.e. upwards of 3000 units. Your set-up cost is spread over a large amount of units and the cost thereafter is made up of substrate costs only, as the volume increases. But if you are printing only 100 business cards, the paper accounts for only 2.7% of the total cost so you can understand how little your paper choice affects the price there. So how else can you save money? Stick to standard sizes where possible and thus maximise the use of the printable area on your sheet (check out our paper size guide if you are not sure what a ‘standard size’ is). Other things that make your work look great but add to the cost significantly, are finishes like lamination, embossing, foiling and die-cutting. Some lamination is also not great for the environment so we recommend substituting it with a varnish instead. Very quick, very affordable and if you get creative you can do some funky stuff with it too! Sometimes necessity is the mother of invention and it’s amazing what one can achieve on a limited budget if you think out the box. We’ve done quite a bit of that so chat to us now about how you can keep your costs down.